The property has no no amenities, rooms are very basic, motel like, no refrigerator, no coffee pot, very small room, extremely overpriced. Would not ever stay here again when visiting NYC! The location could not be more perfect as it is very close to Grand Central and steps away from the wonderful food hall Urbanspace. The lobby is lovely. I was dismayed that the room did not have a coffee maker; the only option was to purchase an entire pot of room-service coffee for approximately US$16. I have never encountered this, and I travel often for work. This property stoped in time! My room was old and ugly, carpet smelled bad and drapes were falling apart. The room was dark, with an old tv in the corner. No amenities. The rooftop that they show in the website is closed, under construction. The hotel doesn't offer room service, besides breakfast hours. The bar at the lobby is small and old, no ambiance and service is slow. Entrance was nice didn't like water pressure in shower . It was a good experience but the terrace was close. In general de room was clean, except one of the garbage cans that still had some garbage, but the beds and bathroom look clean. Great location. Nice staff. Very beautiful hotel. The room was clean and not too loud. The lobby bar was like a sportsbar (ugh, tvs!) and basic beer selection, and not enough people working, but the bar staff was friendly. As a former resident of New York I was concerned about cleanliness. The city itself is/can be very dirty and therefore I had grave concerns about staying at a hotel. This hotel is very affordably priced, which is nice but actually also increased my concerns. I was very pleasantly surprised about how super clean it was. I'm a bit of a Felix Unger so my standards are high! If I have base it on my room (which looked like a motel 6 room and not a hotel) I wouldnt stay there again amd wouldn't recommend it to anyone. Every looked old and worn. Either the bed or towel or something there gave me chest rash. The lobby area is nice and elevators. The staff was great. The location was great. The room was small and dingy. The bathroom had no grab rails in the bath/shower and the tub drain assembly came right off the porcelain. It also leaked dreadfully so I couldn't take a proper bath. There was also no counter space on which to lay out makeup and very little space for even basic toiletries. Finally, the room had a ridiculously noisy window a/c unit. It woke me up at night with it's noise. Great old school NY Hotel. Rooms are a bit small, but staff are friendly and the property is affordable. 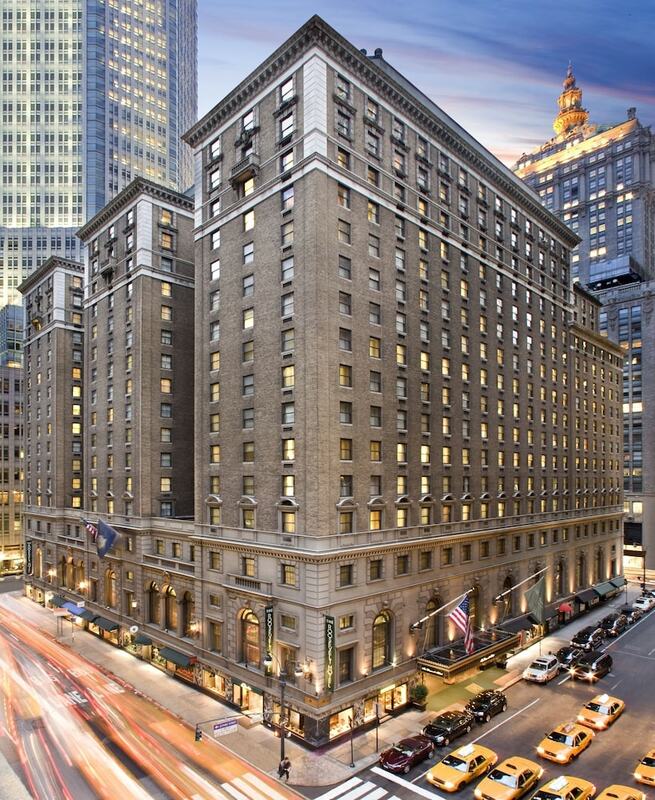 Located in Midtown, The Roosevelt Hotel, New York City is adjacent to 5th Avenue and within a 5-minute walk of other popular sights like Grand Central Terminal. This 4-star hotel has 3 restaurants along with a 24-hour health club and a rooftop terrace. This hotel is home to 3 onsite restaurants, perfect for a quick bite to eat. Order from room service to satisfy your hunger without leaving your room, or make new friends over drinks at the bar/lounge. For your convenience, breakfast is available for a fee. A flat-screen TV comes with cable channels and pay movies, and guests can stay connected with WiFi. Beds sport premium bedding and the bathroom offers a hair dryer and free toiletries. Other standard amenities include a safe, a phone, and an ironing board. At The Roosevelt Hotel, New York City, guests have access to a 24-hour health club, a rooftop terrace, and WiFi in public areas. Valet parking is available for USD 72 per day. The 24-hour front desk has multilingual staff ready to assist with securing valuables, dry cleaning/laundry, and concierge services. Additional amenities include conference space, a business center, and express check-in. Thank you for sharing your feedback. We are sorry to read we didn't meet your expectations.Your feedback will be shared with our management in our continual effort to improve guest satisfaction. Thank you for sharing your feedback. We are glad you enjoyed your stay with us and we felt like a "home away from home," We hope to welcome you back again soon! Dear Karla, Thank you for sharing your perfect review! We are glad you enjoyed much of the hotel. We do have coffee machines in our suites and can provide them in other rooms by request. In the future, we'd be happy to make that accommodation for you! We hope to welcome you back to The Roosevelt again soon! Thank you for sharing your feedback! We appreciate guest insight! We hope to welcome you back to The Roosevelt again soon! Thank you for sharing guest feedback! We value guest insight and hope to host you again in the future! Thank you for sharing your feedback. We are glad to see you overall had a good stay with us! We do have plans for a guest room renovation this year which will be a great enhancement to the hotel. Your feedback regarding the bathroom will be shard with our housekeeping manager. We hope to host you again soon! Thank you for sharing your review. We are disappointed to read you didn't enjoy your stay with us. Your opinion will be shared with our management. Thank you for sharing your feedback. We hope on a future visit to NYC, we'll have the opportunity to host you again. Dear Paula, Thank you for sharing your feedback. The terrace is indeed currently closed. It will open back up again next year, We are updating our website to reflect that information. We hope on a future visit to NYC, we'll have the pleasure to host you again! Thank you for sharing your feedback. We appreciate guest insight. We do have plans for a guest room renovation this year which will be a great enhancement to the hotel. We hope on a future visit to NYC, you'll consider giving us another opportunity to host you. Recreation features at The Roosevelt Hotel, New York City include a 24-hour health club.